ZERO problem filling my cart this year, I have been needing a lot of stuff! S-One Lifer helmet liners - I really like my Lifer helmet, much better actually than I ever liked my hockey helmet. But, the liners do compress with wear and have to be replaced. I fear that not replacing mine may have contributed to my eye eating track, which is my own fault! So I ordered replacement liners, and as long as I was doing that I ordered three sets of them. 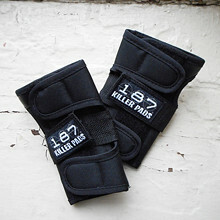 187 Killer wrist guards - I haven't bought new gear in a shamefully long time, like maybe 2011? This is just me replacing what I like. 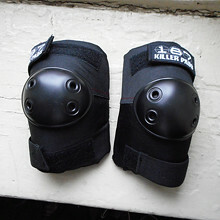 187 Fly elbow pads - Samesies, I get the Fly instead of Killer elbow pads because they're cheaper and ::jinx hex:: I never fall on my elbows. 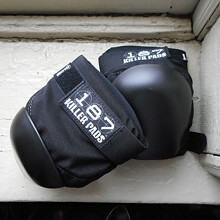 187 Killer knee pads - Samesies! 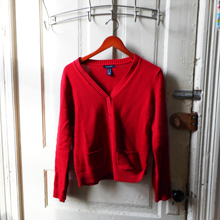 Lands End Drifter red cardigan - I haven't updated you with this critical piece of information, I finally got a work cardigan that I don't hate, i.e., this cardigan in black. Now that I work more days a week, I need more sweaters. So I got this in red. 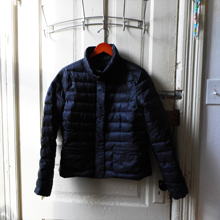 Lands End black puffy coat - Eeee! This is the best, you know I didn't have a winter coat for riding my bike in. Just layers and layers of hoodies under my Fury track jacket. But TMI in a boring sense, this saves my hoodies from getting flat and cold from being worn outside and they stay fluffy and warm for inside. Also when I get sick of winter, what I'm sick of is putting on all those damn layers. This coat is so thin! It's so warm! I still layer it under my Fury track jacket, and it's just right. 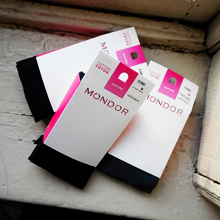 Mondor cotton tights - Just getting a few more of the best tights ever because of the aforementioned working more days a week. The six pairs I got two years ago are holding up great and still look practically brand new. Crazy Control wheels - I also haven't bought new wheels in ever, probably also 2011. I've been swapping the three sets of my good old Jukes around to squeeze more life out of them, but it's just time for them to give up the ghost. So then I was researching new wheels, the whole wheel landscape has changed since I last looked! 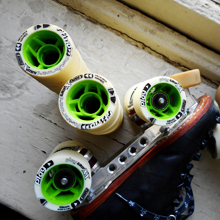 Which made my brain fold over, so I just bought these wheels by Crazy Skates because I liked their little scheme. 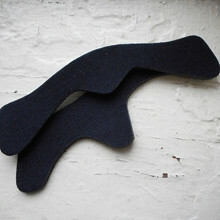 And also, I love my Crazy Skates toe stops. Anyway they come in three hardnesses: Rewind which is 90, Play which is 93, and Fast Forward which is 96. I've been skating on 95/97s and as long I was getting it done, I went ahead and got a set of 93s and 96s to try them out in relation of each other. Last Sunday I tried the 96s, first at learn to skate where I slid out a bit demonstrating a 10-sec one lap, and then lol jamming in scrimmage where I wiped out a couple times trying to quick stop behind the pack. Next Sunday, the 93s! Brb! Eight Presents 2014: Where Are They Now? So insanely busy at the end of last year, updating this slipped through the cracks! Oh god tell me that I didn't buy all new gear three months before I retired from roller derby for good. This sweater is totally clutch. This puffy coat is almost too good, it's blown up my whole outerwear scheme because I only want to wear this. These are the best tights ever.